Forget About The Cowboys, You Play Them Next Week. 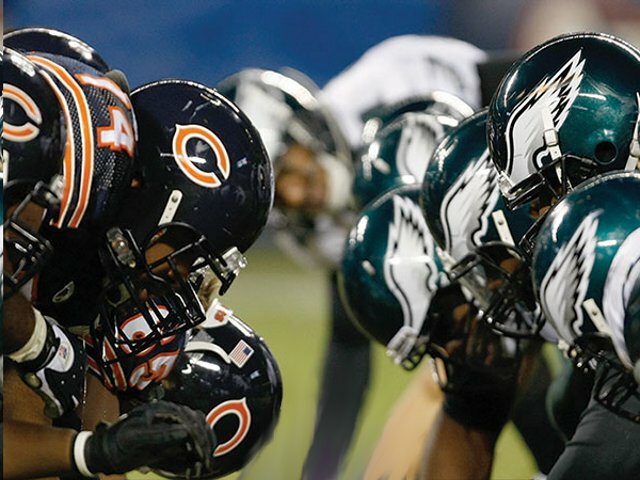 The most important game of this week for the Eagles is against the Bears, not Cowboys/Redskins. The Eagles could potentially clinch the NFC East on Sunday night at Lincoln Financial Field with a win over the Chicago Bears along with a loss by the Dallas Cowboys earlier in the day. Undoubtedly that has been on the minds of fans ever since Tony Romo threw a late interception near the end of the fourth quarter last week to seal another December loss for the Cowboys. Obviously Eagles fans will be tuned into the Cowboys-Redskins game at 1 pm and be rooting for the Redskins, I will be too. Regardless of if the Cowboys win or lose, that does not change the fact that the Eagles must beat the Bears on Sunday night. Interestingly enough, the Bears find themselves in a similar situation heading into Sunday night’s game. Losses by the Lions and the Packers along with a win over the Eagles would mean that the Bears clinch the NFC North. Because of the scenarios, the question has been raised as to whether or not either team, or both teams, will rest key players as the game may not have any playoff implications. As far as the Eagles are concerned, their number one priority has to be to beat the Bears, regardless of what happens earlier in the day. Even if they can’t clinch, they can’t go into their week 17 matchup against the Cowboys with two straight losses. Some fans and radio hosts have pointed out Chip Kelly’s “college football mentality” coming into play (in other words, every game counts, lose one and you’re done). Now is not a bad time to have that mentality. Chip Kelly was pretty spot on with how things should be on Sunday. “I’m worried about what we can control” Kelly said at a press conference earlier this week when asked if he would rest his starters. The only thing the Eagles have any control over is how they play against the Bears. And what if the Cowboys beat the Redskins? If that were to happen, then the Eagles would be playing for potential playoff seeding and that’s it. That is still no reason to rest your starters. This team is in its first year under a new head coach. Even if they can’t clinch on Sunday night, why not use the game as a tune-up for the week 17 showdown against the Cowboys? The Eagles have a lot to gain, and not much to lose, from week 16 while the Cowboys have a lot to lose from week 16. I have had faith in Chip Kelly since week 1 and in Nick Foles when he came in for Michael Vick last season against the Cowboys. A Cowboys loss would be nice. but at the end of the day, the Eagles have to beat the Bears plain and simple. Romo or Orton? Orton or Romo?